Overwhelmed Trying to Manage Your Benefits? You’re Not Alone. Are you overwhelmed by the time spent managing your company’s benefits, the difficulty of administering them effectively, and the challenge of keeping compliant with ever-changing government regulations? All while trying to improve the health, well-being, and–consequently–productivity of your employees? You’re not alone. According to a recent study, when it comes to handling their benefits, the challenges facing business owners are very real. Check out a few of the findings. 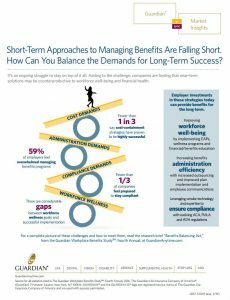 Six out of ten employers say they’re overwhelmed by how complex it’s getting to manage their benefits programs, particularly when adding new coverages, switching carriers, and communicating with employees about their benefits. The most common concern was how to keep benefits affordable for their employees, especially since what’s worked in the past no longer seems to be. Even employee cost-sharing and high deductible plans seem ineffective with less than a third of those surveyed agreeing that they’ve been beneficial. A quarter of employers say compliance was their number one concern, and less than a third feel well-prepared to comply. A whopping 70 percent said they’re not able to keep up with all of the changes associated with the ACA, FMLA, ADA, and paid parental leave laws. Managing employee benefits is far from getting any easier. No one knows that better than us. And no one is more affected than small business owners, as one out of three said they had no dedicated in-house resources to help them manage their benefits program. That’s why more and more employers are turning to the services of a trusted adviser to help them in creating and implementing a benefits packages that’s tailored to the needs of their workforce. If you’re feeling the weight of the challenges described above, give us a call. We can help.